FRISCO, Texas (Jan. 25, 2017) – North Texas Soccer players Jordie Harr and Haley Berg were called up to the first U.S. Under-19 Women’s National Team camp of 2017 in Sunrise, Fla., running from Jan. 28–Feb. 4. 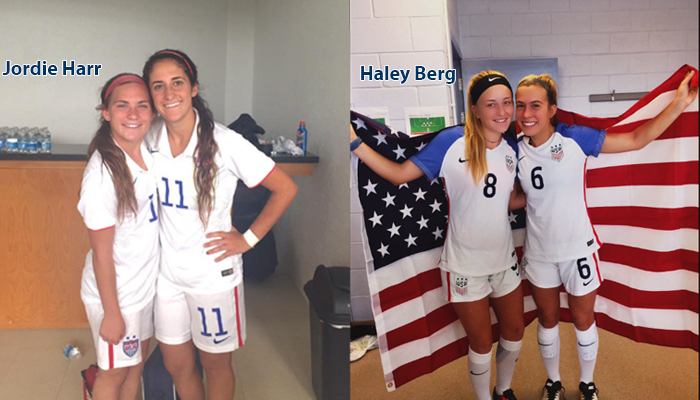 Harr and Berg were among the 30 players, all who are eligible for the 2018 FIFA U-20 Women’s World Cup in France, called up. During the camp, the U-19 WNT will play against the University of Central Florida. Harr gets the call-up after completing her freshman year at Texas Tech University, where she was third on the team in points and was named to the Big 12 All-Freshman team. The two-time Gatorade Texas Girls Soccer Player of the Year has spent time with the Under-18 and Under-20 USWNT in recent years. The Sachse, Texas native is a North Texas Soccer Olympic Development Program (ODP) alum and represented Region III at the 2012 US Youth Soccer ODP Thanksgiving Interregional. Harr spent her youth days playing for Sting, where she competed in the 2013 US Youth Soccer North Texas Soccer State Cup and won the 2013 US Youth Soccer Southern Regional Premier League (SRPL) West. Berg, who was a staple for the Under-18 USWNT in 2016, most recently competed with the U-18 USWNT that placed second in the Women’s International Cup in October. The midfielder from Celina, Texas is committed to play at the University of Texas this fall and has experience playing with Dallas Texans and Solar Soccer Club. Berg has also competed in North Texas Soccer ODP from 2009-12 and competed in multiple Region III ODP Camps.